Welcome to the home of the Bodega Bay Fisherman’s Festival. Since 1973, this event has celebrated our local fisherman and it’s when salmon season is kicked off with a blessing of the fleet. The Festival is packed with events for people of all ages: craft booths, live music, good food, entertainment and more. The Fisherman’s Festival is an all-volunteer event and proceeds from the Festival benefit Bodega Bay Area community services. ONGOING ACTIVITIES, DEMONSTRATIONS, and a WOODEN BOAT CHALLENGE. Westside Park is operated by Sonoma County Regional Parks. Sonoma County Board of Supervisors grant sponsor. 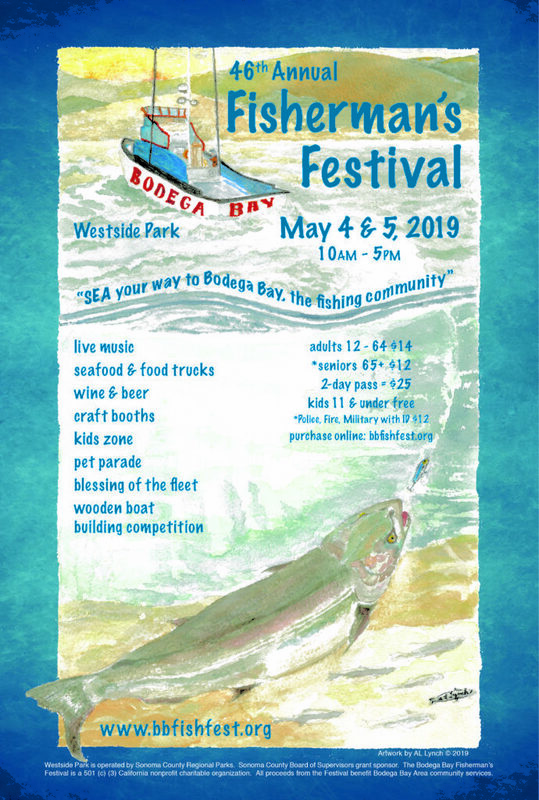 The Bodega Bay Fisherman’s Festival is a 501 (c) (3) California nonprofit charitable organization. All proceeds from the Festival benefit Bodega Bay Area community services.